Each year as the New England leaves turn gold and russet and the morning air begins to hold a chill, Agape, a lay monastic Catholic community in rural western Massachusetts, gathers friends, supporters and the curious to its patch of wooded land to mark the feast of St. Francis of Assisi with a day of prayer and learning. The program consists of group prayer, talks and presentations by speakers working at the intersection of spirituality and activism and an outdoor Mass followed by a potluck dinner around a bonfire as the October woods grow dark. For visitors who attend each year, St. Francis Day is an opportunity to find God in nature, connect with old friends and reinvigorate their commitment to justice while remembering the saint associated with both peacemaking and care for creation. Long before Pope Francis articulated in “Laudato Si’” a comprehensive Catholic call to care for the physical environment, Agape members were focused on treading lightly on the earth and combining a contemplative lifestyle with frontline environmental and peace activism. When not hosting college students for weeklong retreats on Christian nonviolence, hosting survivors of U.S. drone strikes, tending an organic garden or tinkering with a grey water system that reduces well water use, Agape members can be found peacefully protesting in Boston against oil and natural gas pipelines or marching in Washington, D.C., against the size of the military budget. Founded in 1982 by Brayton and Suzanne Shanley, Steve and Nancy James and Father Emmanuel McCarthy, Agape has hosted St. Francis Day celebrations for 35 years. The Shanleys and a rotating cast of community members see a definitive link between U.S. reliance on fossil fuel energy and persistent war-making. Long before Pope Francis articulated in “Laudato Si’” a comprehensive Catholic call to care for the physical environment, Agape members were focused on treading lightly on the earth and combining a contemplative lifestyle with frontline environmental and peace activism. This year on Saturday Oct. 7, the theme is “Listening to Native Voices, Standing Rock is Everywhere.” The guests of honor and speakers at St. Francis Day are Native American religious leaders and activists who were part of the protests at Standing Rock. Demonstrators were organizing against an oil pipeline, one that many Lakota Sioux believed would endanger their drinking water supply. 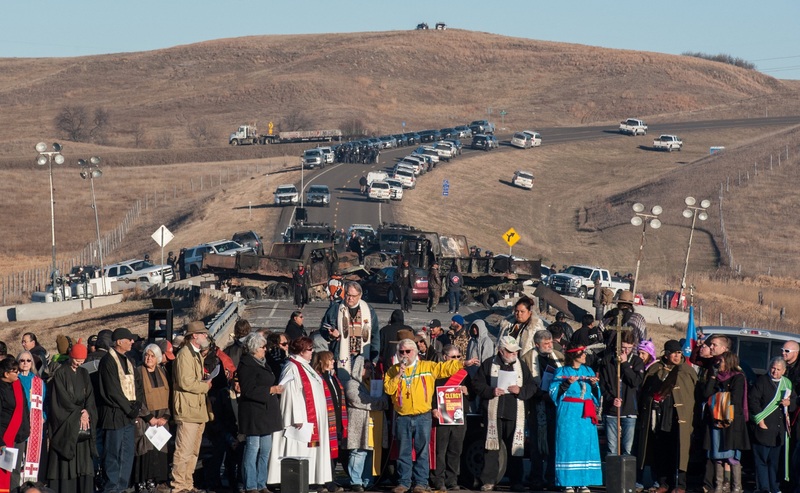 The protests evolved over the summer and fall of 2016 into a galvanizing stand on the high plains of North Dakota in defense of the natural environment by a people whose deepest spiritual beliefs professed the sacredness of the earth. Chief Arvol Looking Horse, who led prayers at Oceti Sakowin, the main Standing Rock encampment, will offer the keynote address at the gathering this year. He speaks regularly of the earth as under assault, sick with pollution and mistreatment. He makes a religious claim that extractive industries and overdevelopment profane a sacred creation. Brayton Shanley met Looking Horse and other Native activists when he made a pilgrimage to Standing Rock last fall. One of the people he met was Beatrice Menase Kwe Jackson, an Ojibwe Native woman, social worker and traditional healer from Michigan. She rose at dawn each morning at Standing Rock to lead hundreds of women in a singing procession to the Cannonball River. There they dipped copper vessels into the threatened river and enacted a water ceremony, a ritual reminding them of and attesting to water’s essential value for all living things. In several Native American belief systems women are held to be the protectors of water, Ms. Jackson said. She will lead a water ceremony at Agape, drawing water from the community’s well and including the expected 400 attendees in the ritual. She has been collecting translations of the Ojibwe water ceremony song and can now teach others to pray it in Japanese, Swahili, Lakota and English. “We want women of every nation, of every people to be able to sing the water song in their own language,” she explained. Other speakers include representatives from the Worchester Intertribal Indian Center, the Ramapough people of Mahwah, N.J., who have long sought federal recognition as a Native American nation, and the Episcopal bishop of western Massachusetts. Bill Toller, a deacon at suburban Holy Cross parish in Springfield, Mass., has been bringing parishioners to Agape for 14 years. The trip is a capstone in their parish JustFaith effort, an adult Catholic social teaching formation program. “When we bring people there who are reading things in JustFaith that challenge them, they are open to Agape,” he said. “There’s always an appreciation to the commitment and sacrifice that Suzanne and Brayton have made to living their Christian faith,” Mr. Toller said. He anticipates a moving interreligious and intercultural experience at St. Francis Day this year. Eileen Markey is an independent reporter and the author of A Radical Faith: The Assassination of Sr. Maura (Nation Books). She lives in the Bronx.